Short of storming the Beltway, the American people may never learn just how much of their money has been pillaged, plundered and simply wasted in the name of “national security” since 9/11, but our research suggests it could easily be an amount that exceeds not only the billions in bailout bucks given to the Banksters since 2008 but the trillions paid to the War Profiteers since 2001. In fact, just as the money being squandered on militarily useless F-22 and F-35 fighter jets will probably exceed our $1.3 trillion federal deficit (see our previous reports), the often untraceable trillions poured into the post-9/11 “too big to fail”, “war on terrorism”, “homeland security” and “black ops” troughs by our corporate-owned politicians and well-lobbied bureaucrats might easily approximate our $15 trillion national debt. One of the hundreds of “security contractors” feeding at those troughs is SAIC – formerly Science Applications International Corporation. Headquartered in McLean VA, SAIC is “a Fortune 500 scientific, engineering, and technology applications company working in national security, energy and the environment, critical infrastructure, and health”. The company’s 46,000+ employees serve the Department of Defense (DoD), the intelligence community, the Department of Homeland Security (DHS) and other federal government agencies. SAIC had revenue of $11.1 billion for its fiscal year 2010. Since 1995 SAIC has contributed over $3.8 million to political campaigns, split evenly between Democrats and Republicans, with Barack Obama and John McCain being the top recipients. That amount is eclipsed by the more than $24 million they’ve invested in lobbying since 1997. And over that same period, SAIC’s penalties for federal contractor misconduct have far exceeded their pay-to-play payola: SAIC paid a $24.9 million settlement for rigging bids on General Services Administration (GSA) contracts, $5 million to the Air Force for false claims and defective pricing, and all told over $32 million for a dozen different instances of government fraud, ethics and other violations. 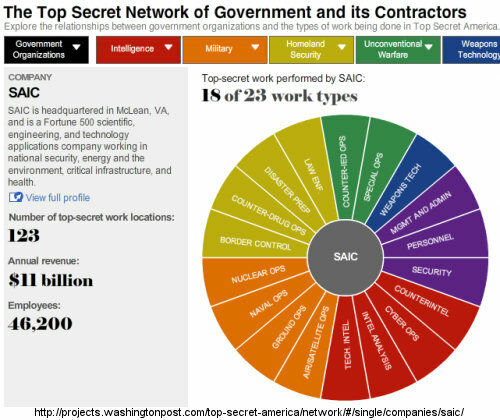 Of course, all their penalties and payola combined is chump change compared to the more than $63 billion in defense, security and other federal contracts SAIC has bagged over the past ten years. Apparently its all forgive and forget at the GSA, because just last week they awarded SAIC a $5 billion telecom systems contract – forgiving their history of bid-rigging, and forgetting that the City of New York recently demanded a $600 million refund on the botched and corruption-riddled “CityTime” system that SAIC installed for them. SAIC will also be getting at least a $90 million bite out of the $4 billion or so that’s been budgeted to relocate the Department of Homeland Security to what was once St. Elizabeths Hospital, an insane asylum. Conceived in the Mad Hatter days of Bush-Cheney, the megabucks DHS relocation boondoggle is yet another fiscal insanity that has continued unaffected by any imagined wave of “Change” in 2008. SAIC’s piece is to implement a “secure and scalable” IT infrastructure. Why SAIC would be trusted to provide DHS with a “secure” anything for their new 4.5 million square foot Ministry of Truth facility is a mystery to me. After all, it was only a few weeks ago that they acknowledged the theft of tapes containing the confidential personal information of 4.9 million Tricare military beneficiaries that were allegedly sitting in the car of one of their employees. 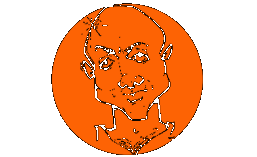 Anyway… False flag op or not, there can be no debate that since 11 September 2001 trillions of taxpayer dollars have been spent to beat the boogeymen, real or contrived. Has it been worth it? Do you think Americans are “safer” today than we were ten years ago? If so, has any security gained been worth the cost, and the personal privacy and freedoms lost? With more than 111,000 employees and over $47 billion in annual revenues, the company’s (dirty) business operations are organized into three subgroups: HealthCare, CropScience and MaterialScience, supported by the service companies Bayer Business Services, Bayer Technology Services and Currenta. Bayer HealthCare is involved in the research, development and manufacture of health products for “people and animals”. Bayer CropScience is engaged in crop protection and “non-agricultural” pest control. Bayer MaterialScience supplies polymers for a wide range of applications. Bayer AG operates through numerous subsidiaries, affiliates and joint ventures located in Europe, Latin America, Africa, Middle East, North America as well as the Asia/Pacific region, e.g. Bayer Chemicals AG in Germany, Cotton Growers Services Pty. Limited in Australia and Polygal 1998 Ltd. in Israel, among others. Using the tainted conclusions of Bayer-sponsored “research” like this as an excuse, profit-before-people corporations like Coca-Cola continue lining their cans with a toxic chemical that they claim to be safe while at the same time assuring the public that they are actively pursuing alternatives. The obvious inconsistency should give you pause. 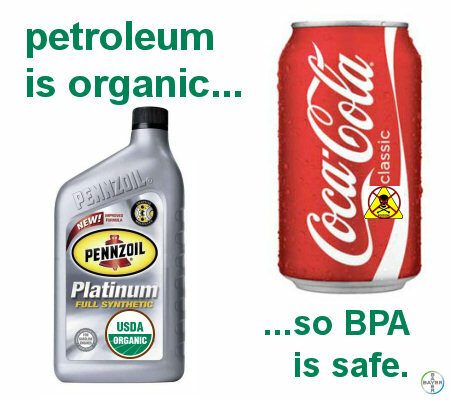 After all, if BPA is as safe as they say, then why are they looking for alternatives?